Quality Bearings & Components is a sales and engineering oriented company. We advise customers as to the selection of inventory that complements their market. We are staffed with an inside sales department capable of providing pricing, product information, buying programs, and technical help. We offer you value-added services including: JIT deliveries, blanket orders, relubing, plus custom-made bearings for your specific application and environment. QBC is an authorized distributor for some of the worlds largest bearings and linear motion manufacturers including: Thomson Industries, INA Bearings Co., THK of America, Heim Bearing, Roller Bearing Co., and many more. 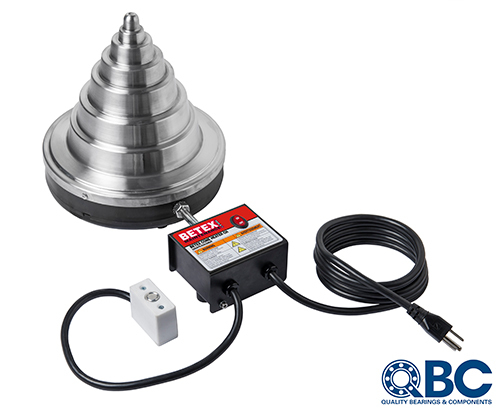 This Portable Induction Heater from Bega works great for bearings and other components » Read More. 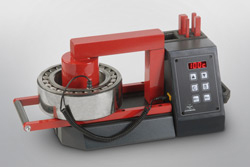 24 RLD induction heater provides easy mounting and dismounting of bearings » Read More. QBC carries a large selection of top quality Thomson Linear Motion Components » Read More. QBC offers a wide range of high-quality induction heaters for safe and efficient use in industrial applications. The sturdy and user-friendly design guarantees years of problem-free operation. QBC induction heaters are versatile and can be used to heat bearings, gear wheels, couplings, etc. QBC offers both standard series (low frequency) induction heaters and a middle frequency induction heater for combined mounting and dismounting applications. Styles available include: Portable Induction Heaters, Bench-top Induction Heaters, Mobile Induction Heaters and Giant (large capacity) Induction Heaters. All the induction heater models are energy efficient. The advantage of the TURBO series over the standard series is that larger components can be heated in a relatively short time while consuming the same amount of energy. QBC/BEGA Special Tools provide practical solutions based on more than 30 years of experience.